Avigdor Liberman's Yisrael Beytenu party has come in for sharp criticism, after Liberman on Tuesday called for the expulsion of Jewish communities to placate the European Union (EU) as part of a regional peace treaty, and Yisrael Beytenu ministers were investigated for corruption. Former MK Dr. Michael Ben-Ari, chairperson of the Otzma Yehudit party, was one of the first to react. "It turns out that with Liberman, like (Ariel) Sharon, the deeper the investigation the deeper the expulsion," he said, referring to claims that Sharon conducted the 2005 Disengagement to cover up corruption scandals surrounding his sons. "Liberman is trying... to be saved from another corruption scandal surrounding him, and as with Sharon, pioneering Jews and the state of Israel will pay the price," added Ben-Ari. "Whoever votes for Liberman needs to know they're voting for the radical left." Deputy Transportation Minister Tzipi Hotovely (Likud) also weighed in on the issue, saying: "after Liberman removed himself from the right-wing camp, the revelation of corruption and serious suspicions against people in Yisrael Beytenu call on the reasonable public to be wary of voting for Liberman." Addressing Yisrael Beytenu Tourism Minister Uzi Landau and Agriculture Minister Yair Shamir, Deputy Education Minister Avi Wortzman (Jewish Home) wrote on Facebook calling on the two to leave the party. "Minister Landau and Minister Shamir - why aren't your voices heard? Yesterday the head of your party, Avigdor Lilberman, continued in his journey to the left in a claim that we must evacuate communities, saying we evacuated Gush Katif and there are solutions," wrote Wortzman. "I ask you - how are you keeping silent? Yisrael Beytenu isn't your home anymore," he added, in a play on words on their party's name, which means "Israel is Our Home." 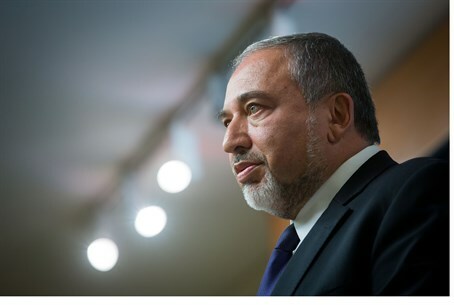 In a closed meeting at Tel Aviv University, Liberman warned on Tuesday that Israel is in danger of suffering EU sanctions if it doesn't reach an agreement, saying "we will need to evacuate isolated settlements. We evacuated Gush Katif. In terms of this there are solutions...I'm less concerned about this." Liberman's plan, criticized by many as being a blatant shift to the left, urges dividing Israel and conceding large swathes of currently sovereign territory including the "Triangle" region of the Galilee so as to "unify" the people, in a plan that would involve coordination with Egypt and Jordan. Recently Liberman said he would not rule out joining a coalition led by the Labor party after the elections in March, to which Likud warned that a vote for Yisrael Beytenu could mean a leftist coalition government. A conspiracy against Yisrael Beytenu? A gag order was lifted on Wednesday revealing that thirty senior figures, prime among them Deputy Interior Minister Faina Kirshenbaum (Yisrael Beytenu) and former Tourism Minister Stas Misezhnikov (Yisrael Beytenu), were brought in for investigation for involvement in corruption. Yisrael Beytenu responded to the investigation, saying in a statement: "as has happened in every elections campaign since Yisrael Beytenu was founded in 1999, this time too the police aren't giving up on media arrests and investigations against members of the party." "If the investigation was published before the advanced elections were announced or after them, it would have been possible to think that maybe this was topical, but the fact that this was done, again, at the time of elections testifies more than anything on the intentions behind the matter, which is meant to harm Yisrael Beytenu," they continued. "We are certain of the innocence of the people and that like in previous times, after the uproar and media tumult dies down, it will become clear that there is nothing behind these publications, except for the desire to harm Yisrael Beytenu which won't succeed," concluded the announcement.